WASHINGTON, D.C. -- One in four Americans (25%) say the most important problem facing the U.S. is government, putting it at the top of the list of their concerns for June. This is up from 18% in May and is the highest percentage citing government since November 2013, when 26% of Americans did so shortly after the partial government shutdown ended. These data come from Gallup's June 7-11 survey, conducted as the Trump administration faces continued controversy over Russian interference in the most recent presidential election and the firing of former FBI Director James Comey. Additionally, Congress has continued to debate repealing the Affordable Care Act (ACA) and passing tax reform. 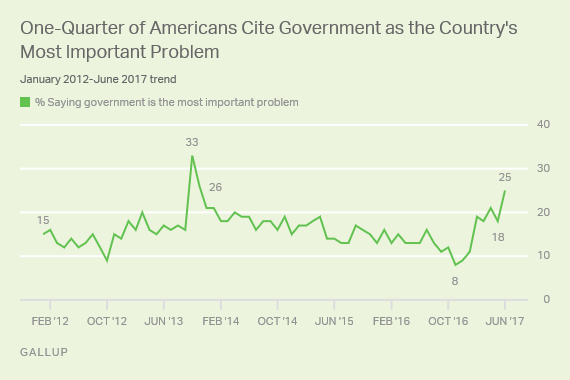 Only once in Gallup's nearly 80-year history of asking the "most important problem" question have more than 26% of respondents named government as the most important problem facing the country. That was in October 2013, during the Oct. 1-16 government shutdown, when 33% of Americans said this about the government. Democrats are currently more likely than Republicans to mention government as the most important problem, though higher percentages of each group name it this month. Currently, 31% of Democrats and 24% of Republicans cite dissatisfaction with government as the top issue, up from 24% and 13%, respectively, last month. Americans who say the government is the country's most important problem cite different reasons. Many mention Donald Trump specifically. However, Congress, the Democratic Party and politics in general are also commonly mentioned. Americans' mentions of healthcare as the most important U.S. problem declined significantly to 7% this month from 18% in May. The May survey was conducted while the House of Representatives voted to repeal the ACA. Still, healthcare remains among Americans' top concerns, behind only government dissatisfaction, and roughly tied with terrorism, race relations, unifying the country, the environment, unemployment and the economy in general. The percentage of Americans who say terrorism is the most important problem facing the country rose to 8% in June, from 2% in May. This uptick follows a series of terrorist attacks around the globe, including in Manchester and London, England, in late May and early June. Fewer than one in five (19%) U.S. adults now cite an economic issue as the most important problem facing the country, down slightly from 21% last month. 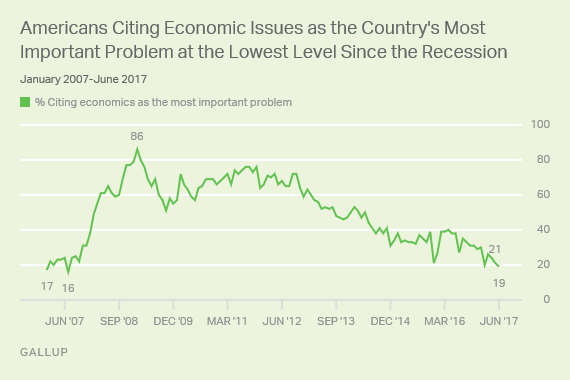 This is the lowest percentage mentioning the economy since before the Great Recession; in July 2007, only 16% of Americans named an economic issue. A smaller proportion (13%) cited economic issues in one previous poll, in May 1999. Dissatisfaction with government has ranked among the top problems in Americans' eyes in recent months, but the percentage naming it as the top overall problem has grown, nearly to an all-time high. This increase in dissatisfaction may herald a further drop in Americans' already-low confidence in government. The increase in the percentage of Democrats citing government as the most important problem is likely attributable to greater media attention to the current political controversy involving Trump. Meanwhile, Republicans' rising dissatisfaction with government could reflect their frustration with Trump as well as anger at Democrats in Congress for their steadfast opposition to Trump. Increased dissatisfaction among the two parties' rank-and-file is likely to lead to heightened pressure on their representatives. Democrats are likely to press their representatives for continued opposition to legislation the GOP proposes. In turn, Republican dissatisfaction may be further stoked by this continued opposition.